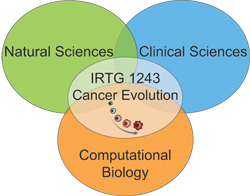 One of the strengths of the SFB 1243 is its interdisciplinarity, joining the forces of very different scientific disciplines to study key aspects of cancer development in an evolutionary framework. This is a challenge and great opportunity for doctoral students in the SFB, requiring them to be proficient in principles of molecular and cellular biology, clinical sciences and computational biology. The expertise of the project leaders will be a valuable resource for internal courses in specialized methods, including for example seq methods, cytogenetics, hematology and data analysis. For external courses, different institutions and programs (LMU, TUM, Helmholtz, LSM, IMPRS, SFB 1243) offer possibilities for travel funding, lab visits or external methods courses. Inquire about possibilities with program coordinators. See other graduate program websites for methods courses outside of the IRTG. See application procedure for IRTG 1243 funding of external courses and conferences.